Queer is a flexible word. It can be a noun, adjective and a verb. Often relating to gender and sexuality, but not exclusively, it often involves non-normative identities or ideas. 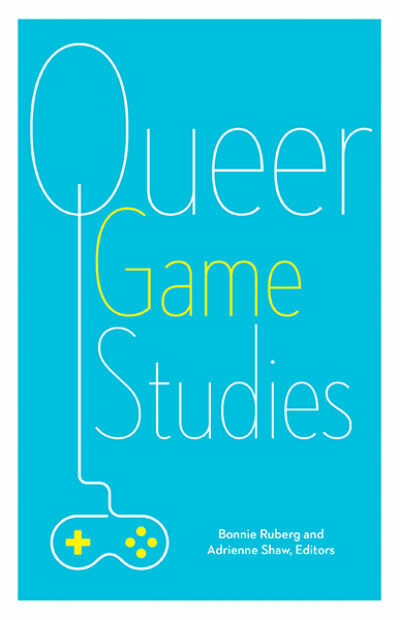 So, this anthology’s title, Queer Games Studies, can be read a few ways: a queer take on (video) games, studies on queer games or even a call to queer game studies. I begin with these thoughts to showcase the breadth of ideas that this anthology are presenting to readers. In addition to discussing LGBTQ characters or applying queer theory to the stories of games, essays also discuss queer players, queer situations, and queering gameplay. The collection features a considerable range of voices, including queer scholars, activists, game journalists and game developers—many of these authors fit more than one of those descriptions—and it goes in various directions of inquiry. Questions are asked about characters, coding, communities and control. Games discussed are not limited to consoles and devices, but also include board games, literary play and social media experiences. There are strong analyses of LBGTQ representation and thought-provoking queer takes on games. Included in this is Amanda Phillips’ argument for the titular character of Bayonetta to be viewed as a site of queer femme disturbance, Jordan Youngblood’s look at the failure of the performance of masculinity by the main character in Metal Gear Solid 2 and merritt k’s reflection on Gone Home and the space(s) it opens up. Across essays in this collection, there is a prevailing focus on the player. Author Derek A. Burrill makes the point that “the body” often gets left out of discussions of gaming, instead focusing mostly the elements of the games themselves. In this vein, Gregory R. Bardnall looks at the hardware players use to interact with video games and the normative assumptions that go into their creation. There are discussions of both offline conventions and online communities of players that develop around games and their complexities. One of the most fascinating inclusions in this space is “Queering the Snapshot: Ambient Mobile Play,” authored by Larissa Hjorth and Kim d’Amazing, which explores the gamification of social media through how queer subjects interact with these platforms and the performances they enact. Queer gaming appears in these games as a barely visible tension between the will to advance and succeed and the recognition of other goals. […] These worlds challenge us as players not in terms of speed with which we move through them but in relation to our altered sense of time, space, awareness, and transformation. The final section features authors imagining futures for queer gaming. Both Kathryn Bond Stockton and Christopher Goetz posit that the queer future of games might not be a growing up, but growing sideways. There are essays and discussions of importance that don’t fit into the above categories. Mattie Brice, in “Play and Be Real About It,” rethinks a common understanding of how people can engage with games by comparing to kink(y) play and emphasizes the importance of recognizing our existence in multiple contexts. Robert Yang examines the coding in Dead Island and its larger cultural implications. Finally, there are multiple takes on BioWare games like Mass Effect and Dragon Age, which present binary options of gender and sexual orientation choices for the main player character. It is always hard to judge whether a collection of criticism has covered an adequate range of topics (even though I have attempted to do so before). There’s a certain degree of finality in a published book; once published it becomes a static object with a finite number of pages that have limited room for various ideas. Yet, collections can also be seen as a way post for those entering into a continuing conversation. Viewed this way, this anthology could be considered a success as it presents a mostly comprehensive collection of contemporary concepts. Though these essays are more easily accessible for those with either some prior understanding of either queer theory or video games, those learning about both can gain a general understanding about these topics. If there is one very minor criticism of this anthology to note it is that, with some exceptions, the discussion of games is limited to those released during or before 2014. Since then indie games and studios have had a larger presence, games are including more queerer elements and queer characters (for example, Undertale both includes queer characters and subverts familiar RPG tropes) and virtual/alternate reality games have gained increased notoriety. These shifts and newer entries present new lines of questioning to explore. Queer theory and video games might be considered by some to be an odd combination. But this anthology showcases both the interesting areas where the two fields overlap and explorations of the areas where there is tension. There is much to create and critique in these spaces and Queer Game Studies provides a broad entryway into these ongoing discussions.